Kim Kardashian, Alexa Chung, Chloe Sevigny: To truly have your It girl status cemented these days, you’ve got to have a book dedicated to your lifestyle and fashion choices. And truly, isn’t Barbie the OG of It girls? The fashion icon has her own Instagram handle dedicated to her wardrobe, @barbiestyle, which is finally being immortalized in a perfectly giftable coffee table book – in a cheerfully bright shade of pink, natch. We hopped on the phone with Robert Best, Barbie’s senior design director, to get the inside scoop on how those perfect Barbie style ‘grams get popped off. Best was working in New York for Isaac Mizrahi when he began to feel burnt out and started looking for a career change. On a whim, he sent his resume to Mattel. “Friends and other people had always told me that my sketches look like Barbie,” he says. “The next thing I knew, they flew me out for an interview and the rest, as they say, is history.” Over 20 years later, Best has been a part of the team behind some of Barbie’s most iconic fashion collaborations, from Jeremy Scott at Moschino to Gigi Hadid at Tommy Hilfiger – all dutifully documented on the @barbiestyle Instagram handle. So what is it like to design for the one and only Barbie? And how do those Instagrammable moments happen? Best gave us the scoop on all of @barbiestyle’s best moments to coincide with the release of The Art of @barbiestyle, available now at Assouline. Walk me through the process of designing for Barbie. You’re able to partner with everyone from fashion designers to movie properties. You can design fantasy, so that the range of opportunity is just so much broader with Barbie. You’re also making a toy, so there’s a fun aspect – if your end consumer is a kid, how much fun are they going to have with this product? Why do you think the Barbie Style Instagram has been such a success? People love to see things that they respond to in real life reflected in everything around them. Barbie Style is just a miniature, tongue-in-cheek version of a social media platform that most people are connecting on, and I think it’s because, when you look at it, it looks like a real-person Instagram. It’s beautifully done. It’s very curated. The fact that it’s a doll, of course there’s a little bit of humor there. It’s hard to not like it, because it’s just funny and happy. In a time when there’s a lot of crazy in the world, I think this is a fun way to break through that’s not offending anyone. Why do you think now is the right time to immortalize it in a book? When you’re at the beginning of something, there’s a lot of risk involved and you think, is this really going to be a thing? Are we going to look back and think, “Oh my God, that was a mistake, nobody followed us, it was a disaster”? It took off really quickly, and it gained momentum and speed in a way that, I would say, the smaller team that was involved in the initial launch never probably dreamed about. It feels like an appropriate moment, given that we have now 1.7 million followers, it’s highly engaged, she’s a paid influencer, and she’s partnered with super incredible people – like Gigi Hadid, Tommy Hilfiger, Chiara Ferragni, all of these amazing partners. 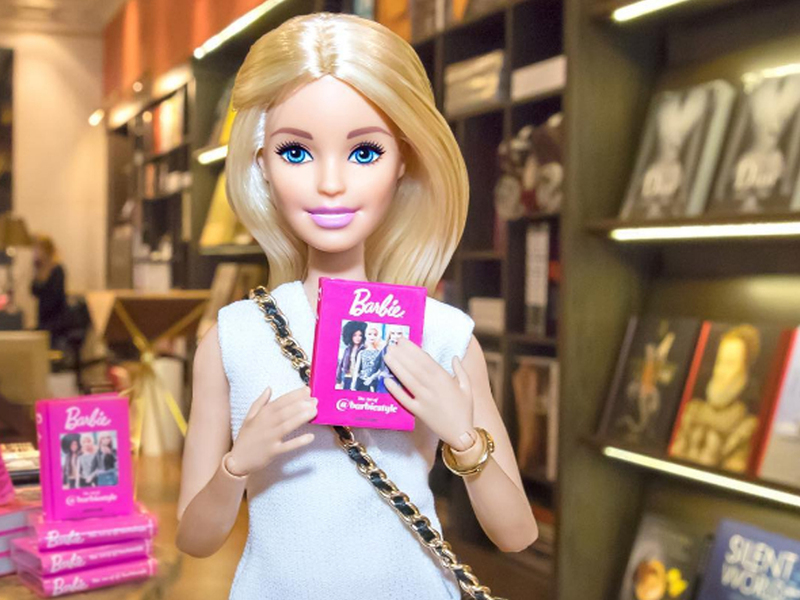 Of course, we’ve worked with the Assouline book people before, and it seemed like a great way to celebrate Barbie, as specific to Barbie Style, and to just have a little moment to celebrate this success. What does it feel like to see your work and your team’s work in a book? How do you guys decide who to collaborate with? We work with an agency in New York, KCD; they’re a great partner, and we have our team here, which consists of creative, marketing, and public relations, and everybody sits at a round table. Everyone just brings all their ideas. We have certain objectives, like we know that we want to participate in Fashion Week; we know we want to work with causes that champion women that are like very pro-women. Then, if you look at the calendar through the year, there’s just fun stuff, like summer vacations or National Donut Day or whatever it is. How do you know when a design is right for Barbie? When I’m thinking about clothes for Barbie, I think of clothes the way I do for women; it becomes personal. When it’s the clothes that we’re creating ourselves, I’m like, “I love leather jackets this week,” or, “Denim’s big, and I want to see Barbie in like some cool denim pieces,” and we’ll think about it that way. What’s fun then is to work with different designers, whether it’s Jeremy Scott or Oscar de la Renta, and see their take on what they want to see Barbie wearing. Do you have a favorite design or a favorite collaboration you worked on? They’re all like my favorite children! [Laughs.] The Moschino collaboration was super fun because Jeremy Scott was such a great, engaged partner. He had so many fun ideas, because he’s also very active on social media, and he allowed us a lot of access. When he did the Barbie collection, he gave us complete access to the Moschino design studio in Milan, so that we were able to bring Barbie and all of her accessories and all the clothes and shoot her in and around the studio. He let us shoot the doll with him. That kind of access and that kind of participation makes it really special and makes it have a whole different level of detail. Who is a dream collaborator you haven’t worked with yet? I’m very excited about Dior having a female creative director with Maria Grazia Chiuri, because I think it’s a cool time for that brand. Barbie’s done Dior partnerships in the past, but it’s a new day, and it would be super fun. We’re looking at who the new people are on the scene, whether it’s in social media, whether it’s in entertainment. We were super excited to see Wonder Woman launching with Gal Gadot; we did a Gal Gadot Barbie. We’re always looking at what’s coming next. What’s next for Barbie Style? Well, we can’t reveal anything that’s secret! [Laughs.] We’re really excited about the launch of the book with Ladurée, so Barbie’s going to be going to different Ladurées all over the globe to promote the book. This article was written by Tyler McCall from Fashionista and was legally licensed through the NewsCred publisher network. Please direct all licensing questions to legal@newscred.com.